If you are looking for a rewarding career that is challenging, has a combination of science and technology, to treat and care for patients who have life threatening conditions, then this might be the course for you. This is the only course in Birmingham that covers oncology, radiotherapy technology and psychosocial issues surrounding cancer care. Our radiotherapy course will teach you to work with patients of all ages, to help relieve and/or cure the symptoms of their cancer. As the only training centre for radiography in the West Midlands region, our radiotherapy course will prepare you to be a fully qualified Therapeutic Radiographer once you have graduated. As a Therapeutic Radiographer you will be responsible for preparing and administering radiation to cancer patients, operating highly technical radiation equipment, imaging patients with the latest technology, monitoring patients’ progress and giving advice as they progress through radiotherapy treatment. You will develop specialist skills by spending half of your time on clinical placements within hospital cancer centres, providing you with plenty of experience to develop professionally and gain valuable employability skills. The other half of your time will be spent at our £71 million City South Campus, which features a Virtual Environment for Radiotherapy Training (VERT) and advanced treatment planning facilities, to enable you to confidently develop essential skills within a safe educational environment. You will learn the science behind radiotherapy practice, as well as the human anatomy and physiology, radiation physics and radiobiology. You will also study the social and psychological aspects of cancer care and the needs of patients to ensure that you leave with all the skills needed to be a professional and expert Therapeutic Radiographer. As you advance your knowledge of radiotherapy practice and the science of oncology, you will develop analytical skills and will explore the research evidence that forms the basis of current and emergent practices. In your final year you will apply research strategies to health and care practice, and merge your clinical skills and knowledge. Successful completion of this course will entitle you to register with the regulator, the Health and Care Professions Council, to gain registered practitioner status and be able to practice in the UK. You will study in our recently extended £71 million City South Campus, and learn from specialist facilities which include a simulation facility and skills suite, so that you can continue developing practical skills in real life environments here on campus. Study abroad - our students are able to work abroad to enhance their skills and development as a part of our unique international travel scholarship programme. See where our Radiotherapy students have visited recently! Student loan finance - have you already studied an undergraduate degree but would like to do a second one in Radiotherapy? You may be eligible for funding. Height statement: Most patients are treated at a height of 120-130cm above the ground. You should be able to comfortably and safely manipulate a patient lying at this height. If not, please contact the Radiotherapy Programme Director before you start the course so the team can ensure that the necessary risk assessments and adjustments can be in place in a timely manner, to ensure your safe practice. Any disclosure will not prejudice your application. GCE A/A2 level 120 UCAS tariff points from a maximum of three A/A2 Level passes, which must include one science subject from Physics, Biology, Chemistry, Human Biology and Applied Science. Psychology and Sociology are only accepted in conjunction with one of the former. A typical offer would be BBB. General Studies and Critical Thinking are not accepted. GCE AS/A1 level Two subjects accepted with two GCE A/A2 levels, which must include one science subject from Physics, Biology, Chemistry, Human Biology and Applied Science, at Grade B or above. Psychology and Sociology are only accepted in conjunction with one of the former. Must achieve a minimum of 120 tariff points. General Studies and Critical Thinking not accepted. BTEC National Diploma in Science Minimum Grade DDM required. International Baccalaureate Diploma Minimum Grade 30 required. Full award (60 credits) of which a minimum of 45 are Level 3 graded credits, including 30 at Merit or Distinction with a minimum of 18 in a Science subject with 6 credits at Level 3 in Physics and 15 ungraded credits at either Level 2 or 3. Must possess GCSE Mathematics and English at Grade 4 (C) or above. The Open University Minimum of 30 Credits at OU Level 1 or above passed in subjects that include Chemistry, Human Biology, Biology or Physics such as SK143 Topics in Health Sciences, S142 Topics in Science, or SK277 Human Biology. Candidates must already hold Level 3 qualifications or above, such as A-Levels or a Degree. Typical candidates will be considered on the basis that their prior education is non science related or has fallen outside the 5 year recent study requirement. Irish Leaving Certificate Maximum of five Highers at Grade H3 or above to achieve 120 UCAS tariff points, which must include either Human Biology, Biology, Physics, Chemistry, Applied science or Science. In addition Maths and English are essential at Grade O4 minimum Unless already achieved at the higher Level. Scottish Qualifications A maximum of 5 Advanced Highers at Grade C or above to achieve 120 UCAS tariff points, which must include one of Human Biology, Biology, Physics, Chemistry, Applied Science or Science. A second reference for Access/BTEC students from the original referee is to be provided to the institution by the end of June of the enrolment year. Places are subject to a satisfactory Occupational Heath Check and Disclosure and Barring service report. Applicants should be aware that qualifications, personal statement, interview, and references all form part of the selection criteria for this course. Applications from mature candidates offering alternative qualifications will be considered. Feedback will only be available to those who were invited to interview. Additional costs include books, writing materials, travel and accommodation at clinical placement sites. We offer a wide range of professionally accredited and vocational courses that require the purchase of, among other things, equipment, subscriptions, professional body memberships and DBS checks, and may require you to pay to attend conferences or participate in placements. Included in your course fees are uniforms for clinical placement. This module is essential to enable your understanding of the theory and practical applications of physics in the context of radiography or radiotherapy. Radiation physics and the safe and legal use of ionising radiation is an essential aspect of the radiation disciplines. It involves the underlying principles of the nature of matter and associated principles and how that relates to radiation production and attenuation its application to imaging and therapeutic modalities. This module will equip you with the fundamental patient care skills that are needed to practice as a safe and competent therapeutic radiographer. In order to provide appropriate care to radiotherapy patients and their families, you must have an appreciation of the patient experience within the cancer care pathway, the psychological effects of a cancer diagnosis, and the psychological and sociological factors affecting patients and staff within a hospital setting. As a therapeutic radiographer you will be required to employ your theoretical knowledge of cancer and its management. This will include a firm understanding of how cancer manifests itself in people, it’s presenting signs and symptoms and its natural history. This module will provide you with the information you will require in your clinical duties, including information you need to communicate effectively via the use of accepted terminology, awareness of the patient cancer journey and the treatment planning and procedures involved with administration of radiotherapy. This module supports your knowledge and understanding of the planning and delivery of radiotherapy to structures in the body. 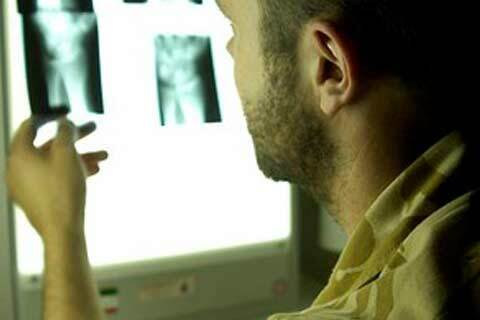 The therapeutic radiographer is required to understand the inter-relationship between anatomical structures on a loco regional level and as they appear on sectional images and this is used to support planning, treatment and verification decisions. In addition, it is important that you have an understanding of the natural history of individual cancers found within these regions, to be able to account for their presenting signs and symptoms and the different ways in which they are managed. Search for the evidence that you need using a logical and structured approach. Demonstrate an understanding of a range of research tools including basic statistics. These skills are necessary to enable lifelong learning and will help you to become a competent and autonomous practitioner. This module is essential to further establish and consolidate your knowledge and understanding of cancer diagnoses, human anatomy & physiology, radiotherapy planning and treatment delivery. This module builds on your understanding gained at level 4 and extends this knowledge to cover cancers that affect the bones, head and neck region, the haemopoietic, endocrine and nervous systems. Using your clinical practice to apply this learning. This will support the programme philosophy by allowing you to apply your developing knowledge and skills through a patient focussed approach. In this module you will cover the principles of radiobiology and the effects of ionising radiation. In addition, you will gain a detailed understanding of the implications of the delivery of therapeutic radiation. This will enable you to have a deep appreciation of the implications of treatment delivery on successful outcomes based upon the equipment and patient related factors. This core module provides you with experience in developing a research proposal which will underpin your future radiography practice in line with the aims of the College of Radiographers and the Health Care Professions Council (HCPC) to embed research throughout the profession. It will require you to develop independence, initiative, innovation and an adaptable approach, to be able to problem solve. In particular, you will be required to apply, develop and propose an appropriately safe research methodology to a radiography related topic of your own choosing. This module is intended to support your final transition from student to registered practitioner. You will continue to build on the reflective and critical evaluation skills that were introduced at levels four and five as a foundation for further development into a competent, autonomous practitioner. As a newly qualified therapeutic radiographer you will be expected to manage the needs of the oncology patient on an individual basis, with consideration for the wider factors that may impact upon cancer care. Clinical decision-making, problem solving and autonomous practice are skills that you will need to have in order to effectively manage the patient. This module is designed to apply the knowledge that you gained at levels four and five to complex clinical scenarios, and encourage your progression into an autonomous practitioner. As radiotherapy is one of the main methods used in the treatment of cancer, this course will develop your knowledge and understanding of oncology, radiotherapy technology, professional practice and the psychosocial issues surrounding healthcare. Once developed, these skills will enable you to use specialist technology to relieve and/or cure the symptoms for patients as well as supporting and developing relationships with them during their treatment. We place a strong emphasis on clinical experience, which we offer via placements. These are your chance to be a part of the working world of health and social care as it really is: your first taste of your career. Your time spent at the university involves accessing learning opportunities that support your knowledge of radiotherapy practice. You will be accessing a wide range of teaching session including lectures, seminars, and small group workshops and electronic resources. You will work closely with other students in your group and will collaborate with students from other year groups and other courses. You will study a minimum of 18 hours per week within taught sessions at the university. The nature of this contact time may vary from week to week dependent on the activities you will access (such as lectures, seminars, workshops or tutorials). You will be employing your team working skills within the classroom setting within teaching workshops. This may include collaboration with more senior students who may work with you as mentors to help guide you and offer their advice with respect to study skills for example. You will also be learning within our virtual environment for radiotherapy training (VERT) where you can practice treatment techniques and study cross sectional anatomy using 3D immersive technology. This Course is approved by the Society and College of Radiographers. Student Kathryn Lester talks about her experience on degree course BSc (Hons) Radiotherapy at Birmingham City University. Mature Student Katherine Redding talks about her experience on degree course BSc (Hons) Radiotherapy at Birmingham City University. Many of our students continue on to complete Masters level study that supports their professional development to advanced practitioners. All qualified radiographers have a statutory obligation to evidence their Continuing Professional Development. I found it difficult to get back into studying after working, but after the first semester this got easier. The placements were also a lot to get used to, but ended up being the most enjoyable part – I found the patient interaction especially rewarding. Students undertake elective placements at a location of their own choice in year 3 of the course. Previously students have undertaken hospital placements in Australia, Cyprus and Ireland. You will be gaining a professional qualification that will enable you to gain employment within the wider NHS. The clinical skills you gain will support your developing competence and enable you to undertake the role of a qualified therapeutic radiographer. You will gain competence in the safe and effective operation of cutting edge medical technologies and develop autonomous practice skills including decision making and care provision. Your qualification will enable you to seek professional registration with the Health and Care Professions Council and membership with the Society of Radiographers. You will receive opportunities to develop your employability skills whilst a student. This includes development of your ability to mentor others, practice your interview skills and job application writing skills. You will spend at least 50% of your time undertaking hospital-based clinical placement learning. You will usually accrue experience at more than one placement site, and will provide treatment delivery and patient care within a wide variety of clinical expertise. Students will engage with the latest radiotherapy treatment and imaging techniques and will gain experiences of professional groups in the wider multidisciplinary cancer care team. Our graduates secure employment as therapeutic radiographers. Therapeutic radiographers are responsible for the planning and accurate delivery of radiotherapy treatment using high energy radiation, as well as the support of the patient as they undergo their treatment. They are the only healthcare professionals who are qualified to do this, working in a multidisciplinary environment, with medical physicists, engineers, clinical oncologists and other healthcare professionals to ensure the holistic care of the patient and their carers is enabled. Our graduates commence their working lives as therapeutic radiographers deploying effective and safe treatment to cancer patients. Once further experience is gained radiographers are able to specialise and develop their skills in differing areas of practice. Our graduates have gained expertise and competence as advanced practitioners in the fields of treatment planning, dosimetry, imaging, education and research. 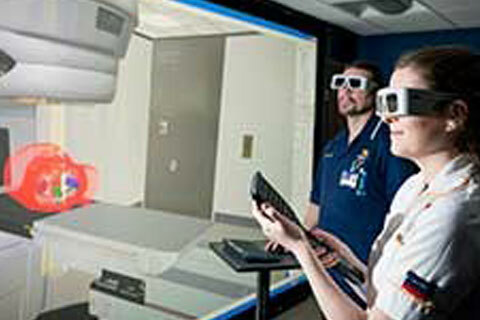 We are also a major pilot site for a state-of-the-art, radiotherapy virtual clinical training facility, which will help to support you with your training. This unique facility will allow you to simulate x-ray techniques using the latest computer software. With this new technology, we are the best equipped radiography centre in the region. This is a real, working X-ray room, where students can practice taking x-rays and also to digitise them to view on the PACS system. We use a portable camera system that can record and stream video to any other classroom on the campus so we can simulate scenarios with our students. We maintain close links with the College of Radiographers and are active publishers in the main journals, such as Radiography and Practice. Staff also are very busy with relevant research projects in the field of radiography, and can often be found on the scholarly conference circuit, sharing their expertise.